Audi Planning R10 Diesel Supercar? Ditching the electric powertrain of the R8 e-tron, Audi could be taking a page out of its motorsport playbook with a diesel supercar. 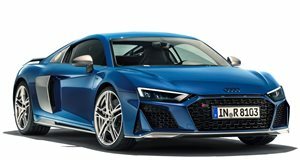 Late last month, we reported that Audi was apparently rethinking its R8 e-tron supercar mainly due to the rise cost of batteries and dwindling consumer interest. Although we haven&apos;t heard any new updates about the future of that program, Autocar is now claiming that Audi is instead turning its attention to developing a Le Mans-inspired diesel hybrid hypercar. Sources indicated to the UK publication that this new halo model could sit above the even R8 and be badged as the R10. Inspiration would likely be taken from the German automaker&apos;s Le Mans-winning prototypes that have propelled Audi into the record books under diesel power. Whether the road-going supercar would go with a conventional oil-burner or take an assist from a hybrid battery system, however, remains to be seen. Audi experimented with a diesel supercar concept in 2008 with the R8 TDI Le Mans show car, but the program didn&apos;t advance beyond that stage. If such a supercar were to come to fruition, expect to see a lightweight carbon fiber monocoque to offset the added weight of a diesel engine.